I had a great time blog hopping yesterday! I wish there were more hours in the day to see all the great blogs out there. I apologize if I missed yours. 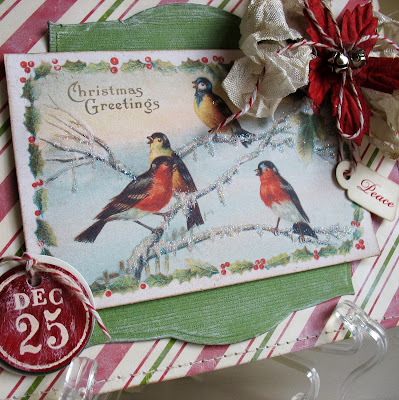 I saw so many lovely and festive Christmas projects and a lot were vintage style which inspired me to create this card. I scanned an antique 1914 Christmas post card I bought over the summer while antiquing in Selma, N.C. for this card. I adore birds so this post card called out to me! I used a liquid glue pen to go over the snowy branches and then sprinkled with glitter. If you can't see it very well, click on the picture to bring up a larger copy. 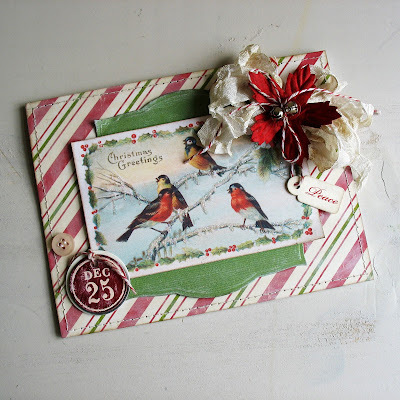 All the papers and embellishments I used are from my stash...some oldies, but goodies! I've included a copy of my antique post card for you to download and create a project with. If you have a chance to use it, I would LOVE to see what you make with it! Now I'd like to share a picture with you. 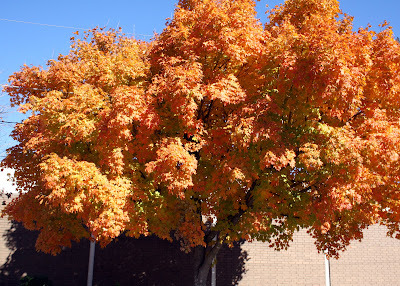 Although we have all started making our Christmas cards and projects, it's still fall and I came across this gorgeous tree while I was out and about last Saturday. I was about to pull into the drive through at Baskin Robbins/Dunkin Donuts for a shake, when this tree caught my eye! Wow! I stopped the car, rolled down the window and leaned across my friend in the passenger's seat to snap this photo! ;) Oh how I wish I could transplant this beauty in my own yard! Isn't it glorious? Bright yellow with orange/red edges! It's all about enjoying the little things, right? Hope you enjoy my photo and if you still have some turning trees in your area...be sure to enjoy them before the leaves fall. This is such a gorgeous Christmas card!!! kathy I just love your vintage style on this beauty! seriously, you are AMAZING!!!! Gorgeous card as always! Gorgeous card, Kathy, and thank you for this awesome image! SO GREAT. Love this card might have to scraplift it. wink-wink. Beautiful card, tree, and vintage image. Thanks for the free download :) Can't wait to use it. Kathy I love your vintage card, its beautiful! I have been in the card making fever too!!!! I am enjoying the process much more this year! I LOVE fall too and that photo is beautiful. When I drive around town and see all the lovely trees turning beautiful colors I am always in awe! It's a gorgeous photo! I just love this Christmas card, Kathy! Those oldies but goodies sure make for one beautiful combination. Love that vintage image, too, and your design is wonderful. I've downloaded your postcard and will definitely be using it. Thanks for sharing. That tree was amazing wasn't it? Your photo turned out great. Hi Kathy, thanks for that sweet image - I will use it, I'm sure! And that tree is wonderful! Our leaves have all fallen here, but I did enjoy them this year. You asked about my bluebird header - I just googled something like "winter birds" and it was one of the images that came up. I love it too! Ohhhh WOW! It's WONDERFUL! Beautiful download, and love how it came out on your card! Such a pretty card Kathy! That digi Vintage image is fabulous & that tree is amazing! Such a gorgeous card Kathy!! LOVE it!!! OMG, this is BEAUTIFUL!!! 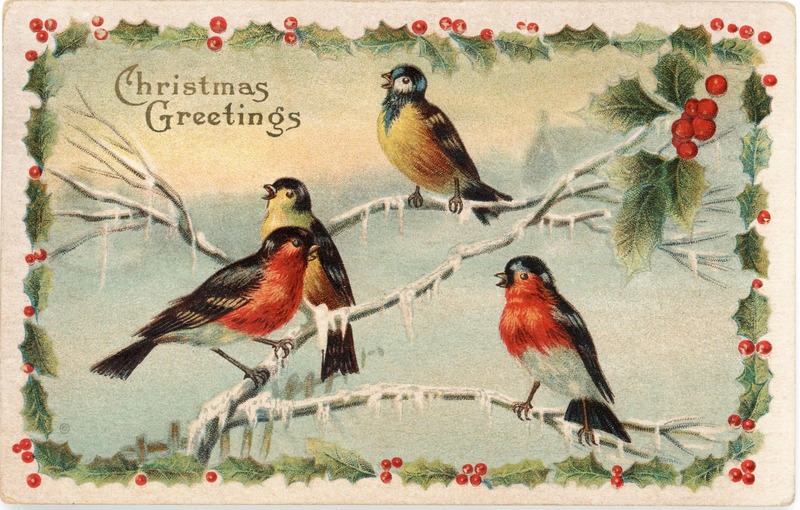 Thanks for sharing that image...not only vintage, vintage Christmas, but vintage Christmas BIRDS!!! Three of my favorites! THANKS! Love love love this card! Thanks for the free download, it's beautiful! So pretty! Thanks for the great postcard share! Gorgeous vintage image and beautiful card. Love the fall trees with the mix of orange, red and yellow leaves. this is gorgeous, Kathy! love it! I’m a wife and mother and adore my family. I’m passionate about paper crafts, cooking, antiquing and reading! I'm an optimist. I enjoy beautiful things. I relish a good cat nap. I love fine foods and sweets. I’m an advocate for animals, autism and our planet. I’m living life one day at a time and enjoying the little things. Visit Kathy Martin's profile on Pinterest. Digital Doodles Tuesday, Giveaway & 25% Off Sale!